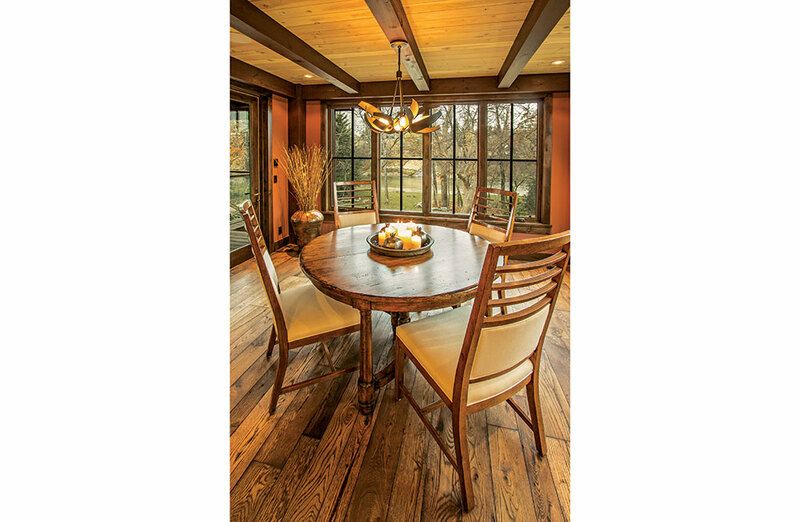 The three-level, five-bedroom house that backs up to a river in downtown Calgary, embodies the “urban rustic” theme the owners and their team were striving for. 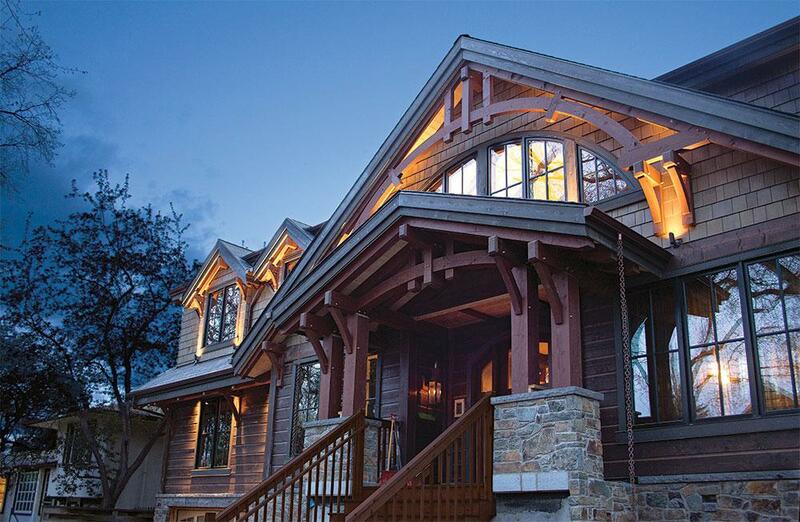 They wanted traditional timber-frame elements, but a richer, darker look, so that was the jumping off point for the entire design, explains Gray. To accomplish just that, Gray started from the outside and moved in, creating contrast in colors, texture and themes. Reclaimed materials are found throughout the house, from the floors to the walls, and they’re paired with surprisingly modern touches, including copper fixtures, slate countertops and sleek lighting fixtures. Combine these furnishes with the rich furnishings in copper, gold and teal, and the result is a lesson in mix-and-match perfection. “The theme here was copper tones, accented with hits of teal and gold,” says Gray. 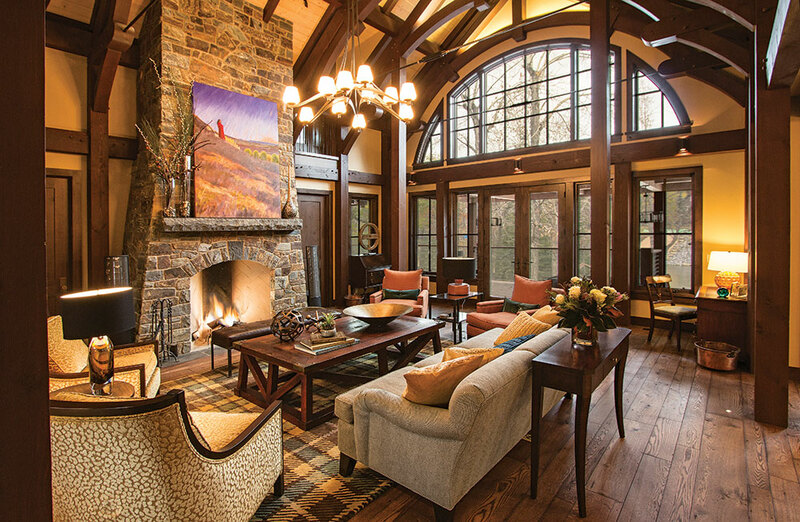 “We incorporated custom furnishings in yellows, reds and tans, and added a plaid rug with the same hues.” Varying textures and rich woods bring depth and interest to the space. Neutral paint colors and a light ceiling complement the cream cabinets and no-fuss pendant lights in the kitchen. 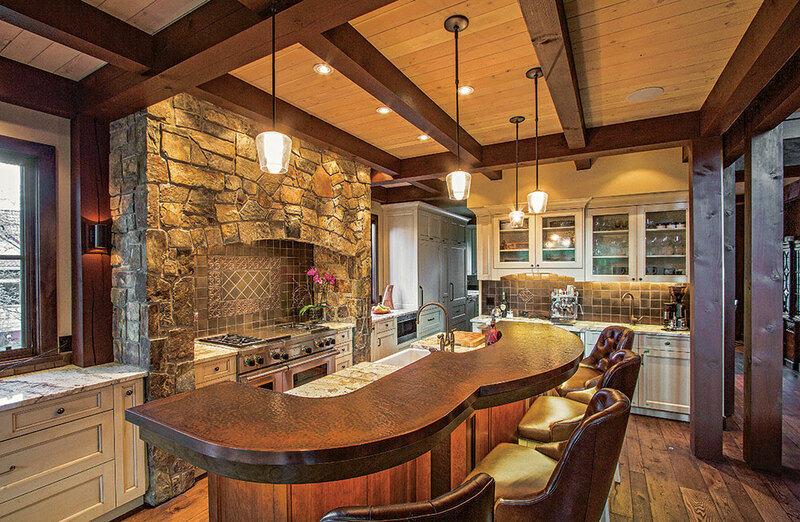 Rustic elements, including a hammered-copper countertop and veneer- thickness stone around the ovens and stove tops, carry the theme of the house into the space. In the casual eating space, simple furnishings work well in the room without taking away from the architectural elements. 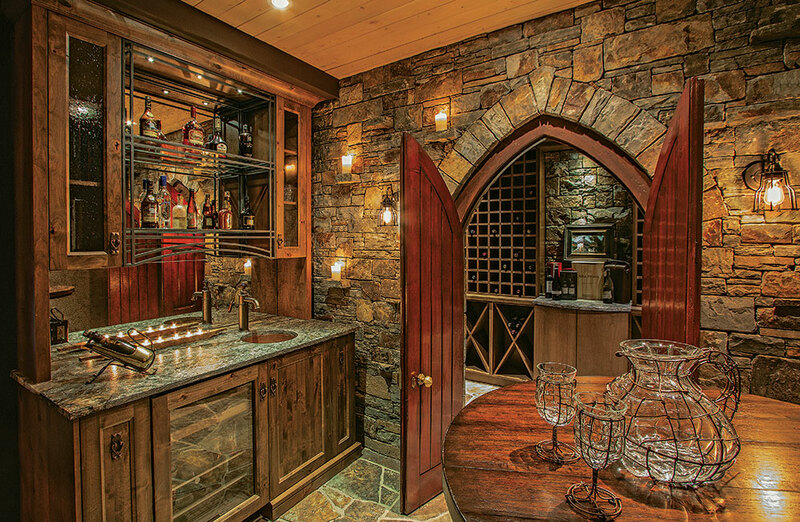 Unique details like this naturally-cool wine room (located underneath the steps at the front of the house) bring a touch of luxury. 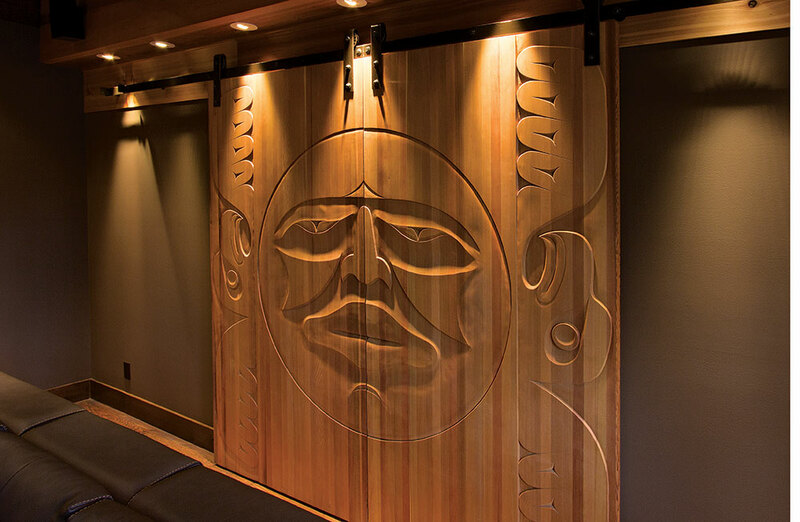 The double doors were salvaged from a Welsh chapel dating back to 1890. 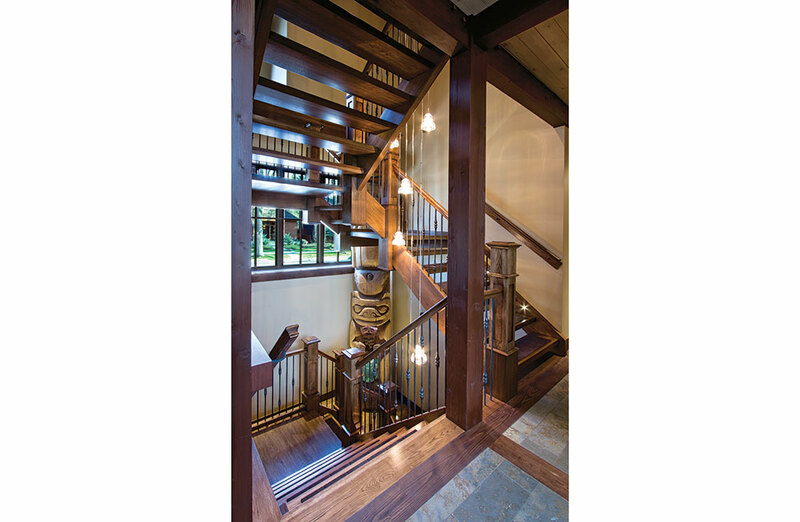 Sleek pendant lights paired with an eye-catching wooden sculpture add visual interest to the open stairway that spans three levels. Sleek finishes like the under-mount white porcelain sink and honed-slate countertop contrast perfectly with the cherry cabinets and overhead beams. 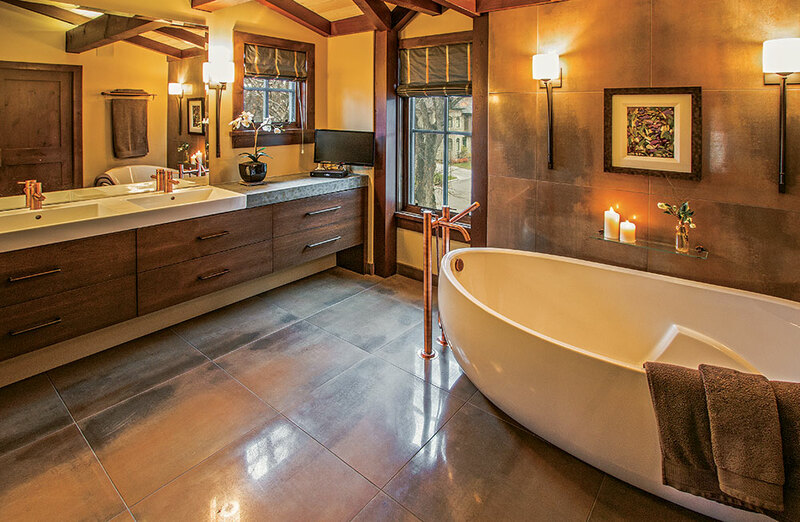 Copper faucets complement the 24-inch “metallic” tiles on the walls and floors. Old meets new in the private office space. 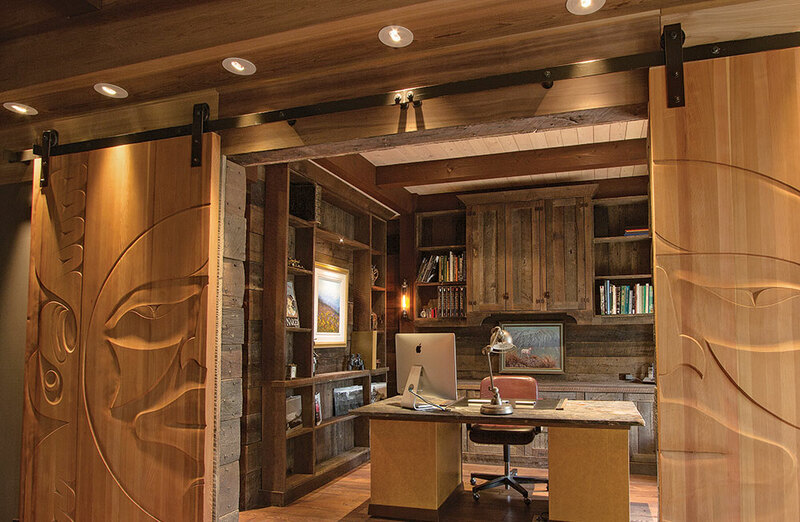 Designed to resemble a miner’s cabin, the room boasts reclaimed barn wood walls and oak flooring. 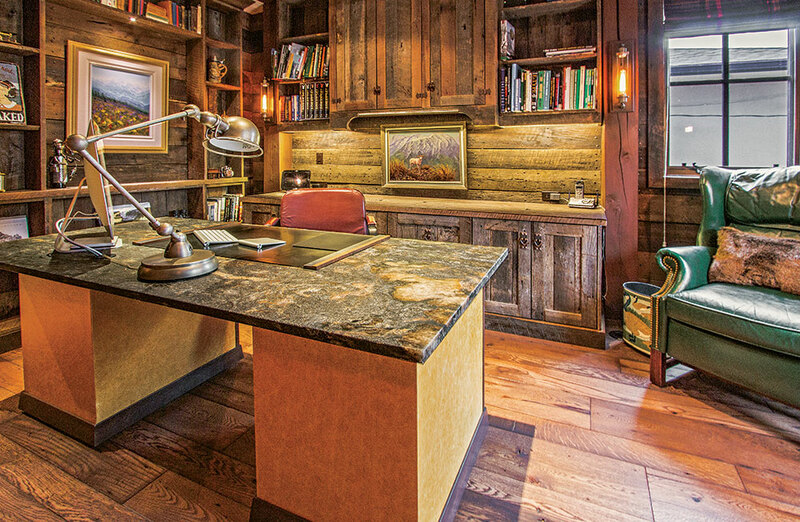 The desk was made from pedestals wrapped in leather and topped with granite in a leathered finish. Plaid wool draperies warm up the room and bring pattern into the space. 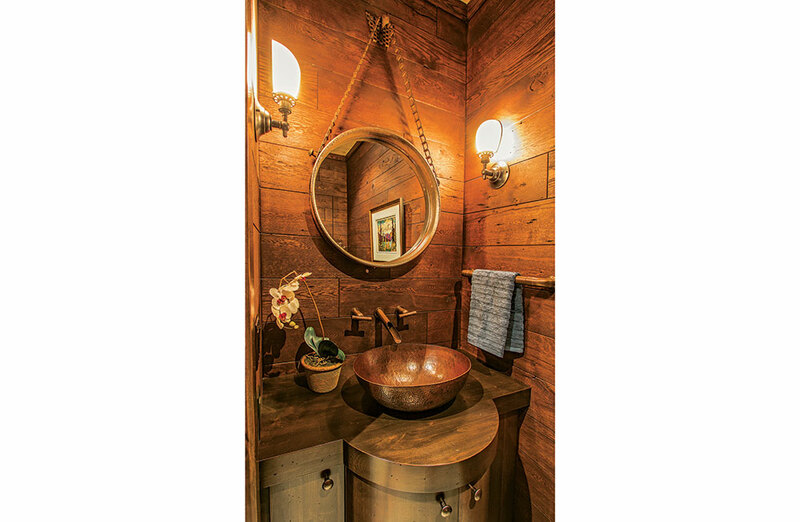 “We wanted the powder room to feel more rustic, so we used the reclaimed oak floor boards on the walls and stained them darker,” says Gray. The custom mirror was made from an old tractor tire and chain.